Thermal performance, energy savings, light management and workplace comfort are major challenges for buildings in the service sector today. Indoor blinds play an essential role, guaranteeing optimal visual comfort. They offer effective protection against dazzle and preserve the privacy of building occupants without blocking the outside view. To fulfil these requirements, Serge Ferrari designs and manufactures high quality screens, implementing Précontraint technology, offering excellent planarity for optimal winding and reduced size to ensure that even large dimension blinds remain discreet. They are suitable for all types of indoor blinds, including roll-up blinds, Roman blinds, vertical blinds, blinds for verandas, glass roofs and shade structures and even Japanese panels. Buildings currently represent the world’s largest consumers of energy. Construction and real estate professionals need effective solutions that are quick to implement to adapt to the new energy challenges without deteriorating comfort for building users. Outdoor solar protection can limit the effects of the sun’s heat on buildings in summer, thus reducing operating costs. Soltis blinds can be installed outside to block up to 97% of heat, offer greater comfort and reduce the need for air conditioning equipment. Précontraint technology makes them very resistant to repeated handling operations as well as to outside weather conditions (rain, UV, wind, etc. ), deformation and tearing. Their smooth surface means easy maintenance and the careful selection of pigments guarantees long-lasting colour. 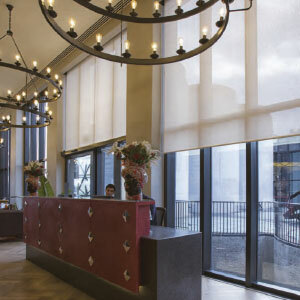 100% recyclable via Texyloop, Soltis blinds are ideal for projects implementing an environmental approach. Current home decoration trends encourage the development of additional living areas outside that are cosy, relaxing and made for sharing. 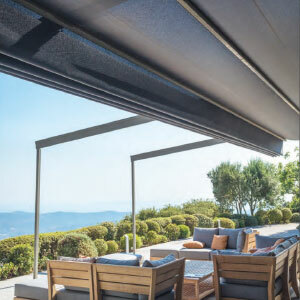 Solar protection solutions can dress up a terrace with elegance, enabling the terrace to be used for longer, without suffering from the heat in the height of summer. 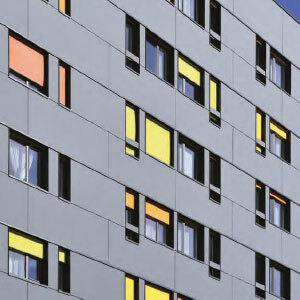 Influenced by current architectural and decorating trends, Soltis fabrics combine technical performance with modernity. Available in a wide range of colours, they are suitable for all types of terraces, from the more traditional to the most contemporary designs. Micro-perforated fabrics allow the air to pass while protecting against the heat and allowing natural light into the home. They give a sensation of freedom, preserving the outside view. Waterproof fabrics offer total protection against UV, heat and bad weather.